I thought that I was all through with secrets and surprises, but it's been a whirlwind couple of weeks!!! Just when I anticipated that I was going to slow down, some wonderful opportunities were presented to me and I just couldn't pass them up! 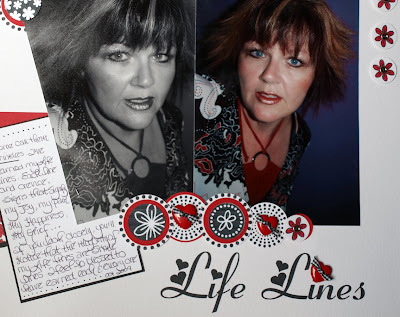 I am very excited to be a part of the (Stamps) of Life by Stephanie Barnard Design Team. Please take a look at the links on my sidebar! I'm thrilled to be associated with such a talented group of artists. I received my digital images the other day and couldn't wait to get going with them. Because I'm a little pressed for time, I created this quick and easy project soley by printing out the images in black and using various sized circle punches to turn them into die cut embellishments. I added colour to the red flowers with a Copic Strong Red Marker. I used my Photoshop Elements to place the title on my page and ran it through my printer... I'm chuckling in a sense because I purchased the over sized printer THREE years ago, just for Scrapbooking! This is the first time I've used it for that purpose, so thanks Stephanie for getting me going! I've earned my Life Lines. I feel so blessed to have earned each and every one. So would you like to win a copy of Photoshop Elements 7? I have a couple of extra that were given to me. If you are interested leave a comment ! I'll choose a winner on the 6th of October (next Tuesday) as I am away for the weekend........but I'll give you more details about that on Friday! A Tale of a Tease~! Hehe..............here's a little Tease of what's coming your way THIS FRIDAY!!!! Yep, I want to SHOUT it out to the world.............you are just going to die when you see some of these images!!! CSAYL #36 and How did I get to 45? Good Morning! Sorry I'm a little late with my challenge card, which is horrible, since I was the hostess this week. 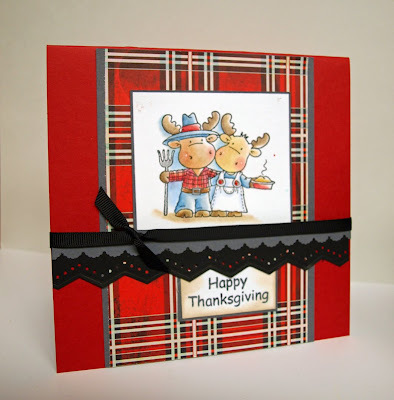 The Challenge was to create a scene with at least two different stamps or stamp sets! 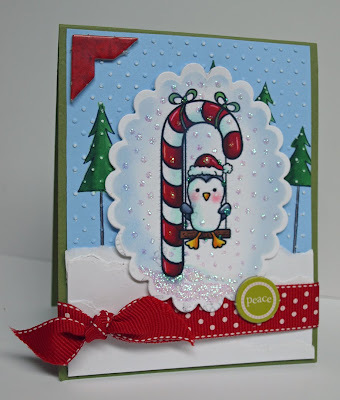 This cute little image is Penguin Candy Cane Swing from Pink Cat Studio's Digital Image Store. The Tree's are from It's Snow Time, a retired SU! set. So, today is my Birthday..........I've never been big on celebrating my own Birthday! I love to make surprises for my friends and family on their Birthdays, but just prefer to observe my own quietly! It's hard to believe that we are already in week four of our challenge blog. Boy, time flies when you are having fun! I'm looking forward to the month of October, because I am the hostess for the month and I hope that the challenges that I've conjured up will be to your liking!!! This is our final sketch from Cindy, our September Hostess Extraordinaire!!! She is totally talented overall and with making sketches.........and to let you in on a little secret, she helped me out by designing a sketch for me for next month!!! I'm excited to share it with you! This card was created with Moffia an image from Stampotique. The Lady bug can be found there as well. My colouring ws minimal on this card as I chose only to highlight a bit with some grey shading (c3 and C5 on this card) and some splashes of red. 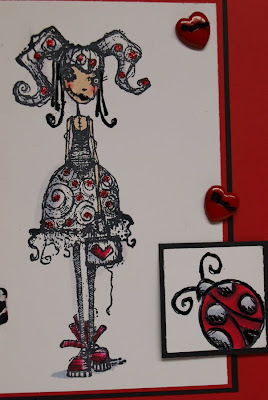 I used some Christmas red stickles on the dress to add a wee tad of interest! Buttons, Ribbon and Metal Heart were purchased at Michaels, the border punch is Martha Stewart. Prism equivalent for Cardstock is Classic Red R095-E with Black Matting. I tried to upload the sketch, but for some reason it didn't want to cooperate and since it's going onto 3 a.m. here and I am risking falling asleep mid post, I will send you over to the C4C blog to see the official sketch because I modified mine significantly! My square is much smaller than specified, but you know what..........it's fun to follow the sketch completely, but it's also neat to use the sketch as inspiration and play with it to get a different result. Another Pink Cat Digi Peek! I really love this image!!! 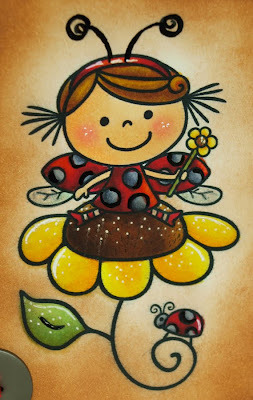 Little Betty the Lady Bug is looking so darn sweet perched on her flower! You can get this new Digi Image over at Pink Cat Studio's Digi Store. At just 3.49 us a piece, they are a steal! Not only that, you have the option of resizing your images to your taste. This was a very simple card! I coloured the image with Copics, highlighted and pollinated with White Gel Pen and then sponged Caramel Ink around the entire image to gie it a distressed look.l I also used some black microliner dots and strokes to add some dimension to the image! I find that for black areas, such as the dots on the lady bug, I prefer to use shades of cool greys, with slate being the darkest colour I use. This is because if you colour something completely black, it tends to have a very flat look and is rather dull looking. Even when the sun shines on something black, you will see shades of grey, dark blue, purple or green depending on the pigment in the paint. 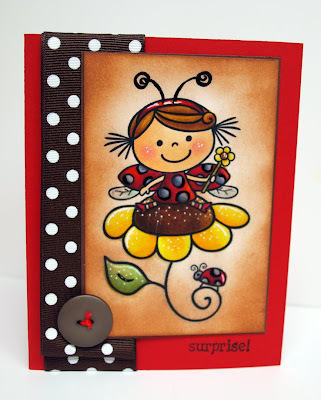 May arts ribbon makes a cool border for this card, picking up the brown in the centre of the flower!!!! Head on over to the Pink Cat Digi Store to see all the neat new images!!! I have SO been feeling like the Keeper of Secrets as of late!! Well this is it, I think! I’m excited to announce that Pink Cat Studio is going digital! 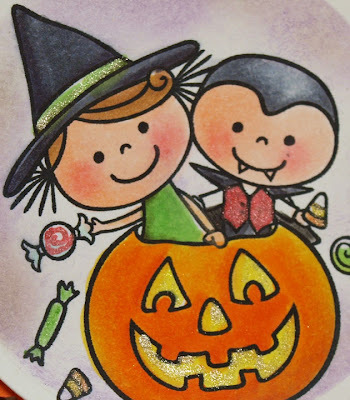 Today Melissa is opening an online digital stamp store with a great selection of brand new Halloween and Christmas designs. So now PCS will have two stores, one for rubber stamps and one for digital stamps. You can check out the new store at: http://www.pinkcatstudio.com/Digital/PCSDigi.htm I am loving all her new images, but I think this one is my absolute FAVE!!! It's called Frank 'n Fairy! I coloured this image with Copics, DP is from Martha Stewart and Screw embellies are from the Dollar Store! I should have a couple more samples up for you later this week! You can check out what the Other Pink Cat Designer and Friends have created for this fun event!!! 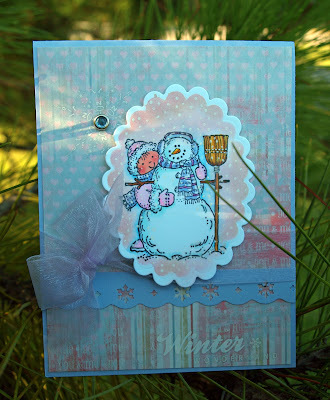 Christmas Stamping Challenge and letting the cat out of the Bag! Our challenge this week was to create a Christmas Card using non traditional Colours! 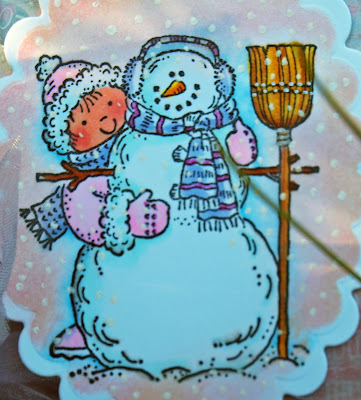 The image I used is from one of the very first stamp sets I purchased, a little dated but sweet!!! The DP is from Scenic Route, last year's Christmas Collection I think! Coloured with Copics and sponged in with Pink Pigment Ink. A little Gel pen for that snow effect! Organdy Ribbon from Michaels and the Border Punch is from EK Success. Make sure you click on the links on my sidebar to see all the great DT work! So, a little more on "THE SECRET"............... I am thrilled to tell you that all summer I have been sharing in the excitement of a very cool Chicka that is opening her own Stamp Company very very soon. 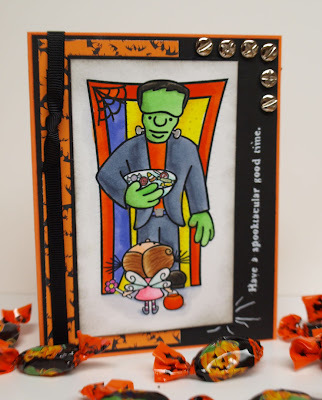 Check out Kraftin' Kimmie's Korner for all the details!!! It has been over the top fun watching Kimmie's venture come into fruition and I feel blessed to have been along for the ride!!! It won't be long until you get to see what Kimmie has in store for you and I can show you some of the images that I've been playing with!!!! 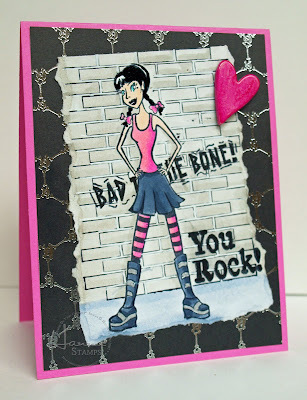 Cindy has brought us another Fabby Sketch this week on our Crazy for Challenges Blog! We are totally excited at the wonderful response the blog has had and although it's difficult to get to see all the cards, we really really appreciate your participation! 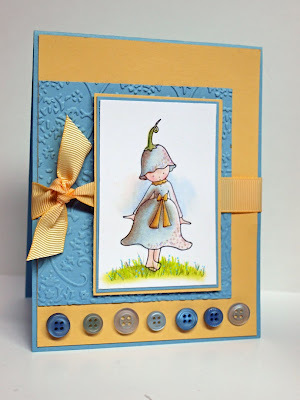 For my card, I used Chatty Cathy from Stamping Bella, who is our very first Sponsor! Isn't she the sweetest? This is the final image that I coloured in the Prism Pencils Class with Paula! So, under her tutalage, I think I did a pretty good Job! DP is from Basic Grey Junebug Collection. Base Paper is a Medium Olive Green. Sure hope that you'll play along! Please follow the links on my sidebar to see what our talented Design Diva's have created for you this week! The DP is from DCWV Rock King Mat Stack and the Base Colour is Hot Pink! Image Coloured with Copics!!!! BIg Big news coming soon soon soon! I've been keeping a secret ALL summer long and I've been Bustin' at the seams to tell you about it........... can I today??? NOPE, but very very very soon. What I will spill is that there is a Brand Spankin' new Stamp Company making it's debut in the next little while and you are going to be BLOWN away by their fabulous images!!!! Stay tuned, 'cause I'll fill you in before you know it! Pink Cat Studio Release Today! Below, you can see all the images and neat sentiments that go along with them! 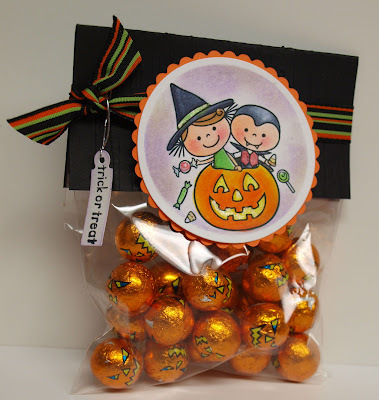 Creating bag toppers are so simple and quick and make a cute little giftie idea! There's not much to describe about this Project. I cuttlebugged the black panel to give it some dimension, but other than that, it was just a matter of colouring the image with copics and cutting it out with my circular nesties. Follow the links on my sidebar to see the designer creations. The sponging around the image ws done with a lavendar pigment ink and a grey dye ink. Glittery Highlights were added with a Spica pen. Cheeks were coloured with Chalk! Pink Cat Studio Sneak Peek! I am TOTALLY STOKED about this month's Pink Cat Studio Release!!!! 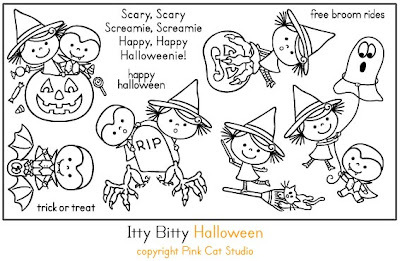 Itty Bitty Halloween debuts two of the cutest new characters, Itty Bitty Betty and Bobby! Melissa sure has outdone herself again!!!! Each and every image in this set is SPOOKTACULAR! 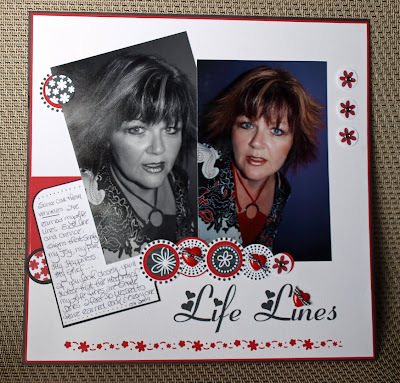 I stamped this image and then cut it out with my trusty Nestabilities Die! coloured with Copics, adding a little Spica and white Gel pen for some Pizzaz! I used Olive and Caramel Coloured Inks to sponge the grave, the grass and and the sky, adding in some grey to the sky just for good measure. In addition to the sponging, I added some chocolate and black dots to the grave to give it a little more dimension. I'm not sure if it's noticeable in the pic, but I added Diamond Glaze to the monster arms. My newest Martha Stewart punch adds a neat border I think. DP is from Imaginisce, not quite sure where I got the ribbon, but I thought it matched pretty well! Don't forget to hit the Pink Cat DT links on my sidebar to check out the other sweet creations that the DT has created for you! You won't have to wait but a day for the release! These images will be available online at Pink Cat Studio Tomorrow! How cool is that! I'll have something else for you to see then! Here we are at Week Two with our Crazy4Challenges Blog Group!! Wow, the DT were OVERWHELMED with the amount of players on our first Challenge. To those of you who playes, thanks so much. It meant a lot to all of us and we are THRILLED with the response! Our message board was buzzing all week long!!!! 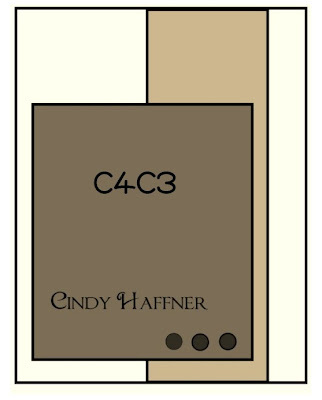 Cindy continues to be our Hostess and has designed another Fabby Sketch for you! 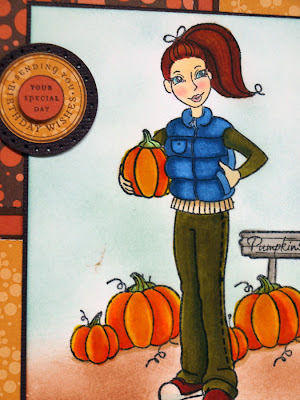 I created this card with the newly released Fall Time set, available at Hanna Stamps. She is very vibrant, as I coloured her with Copic Markers! Just a note, if you see credits lacking for various products and papers, it is purposeful and is from a company that I used to be proud to represent, but who have decided to attempt to censor my personal blog and dictate what I can and cannot put on it. I am very upset that anyone would try to do this and won't allow it and I no longer wish to associate myself with this Company, nor will I promote their products on my blog any more. Prism Equivelant to Cardstock is Desert Coral Dark-OR151-E. Additional Layers are Suede Brown Dark BR309-E. Happy Birthday Gift Card Holder Card! Gee, I have been trying to get this post up for a couple of days for goodness sakes!!!! My internet has been misbehaving and just wouldn't let me do a thing.....or maybe it was blogger, I'm not quite sure!!!! 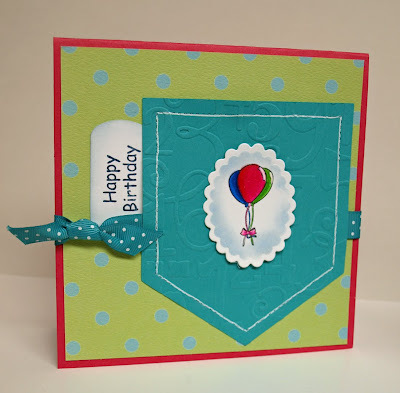 Anway, this card is made with Balloons, an accessory from the new Hanna Stamps Birthday Set. There are lots and lots of cool accessories in this set!!!! Kristi has a great special on purchasing the entire September release in addition to a Back to School sale! The little pocket on the card is glued on very carefully, so that a gift card could be inserted into the pocket, which is a Sizzix die. 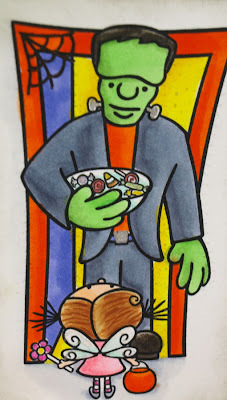 The image is coloured with Copic Markers. Prism equivalent for the Cardstock is intense Pink P111-E. I used some white gel pen on the stitching to emphasize it and cuttlebugged the pocket with the numbers template. The DP is from Paper Trunk. Hope you enjoy the card and we'll see you tomorrow!!!! 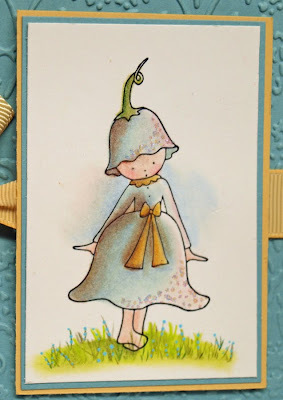 Hanna Stamps September Release Blog Hop! Want to see some COOL September Sneak Peeks??? Well this is the place to be then...if you are already in the midst of the hop, you will have already seen some very very cool samples!!!! 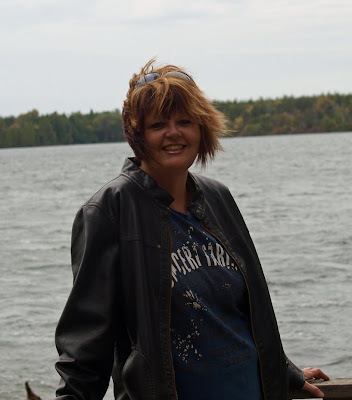 and should have just visited Sandra's Blog Continue the hop and check out Silke's Blog. Don't forget to leave some love for the DT!!! They sure do appreciate it!!!! At the end of the Hop, enter your comments on Kerry's Blog to win some super sweet candy! A $20.00 Gift Certificate can be yours simply for hopping!!!! What do you think of Wheat Riley? This Banjo Pickin' Farmer is just the Bomb!!!! 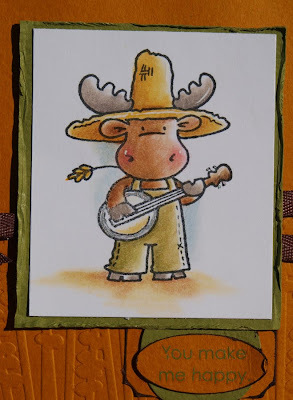 I coloured him with Prisma Pencils and Gamsol......Cardstock is by Prism-Sunflowers Dark Y145-E and Spring Willow Medium-G431-D. Used some Brown Twill tape and various punches and a Rub on to make the sentiment! Good luck with the hop! 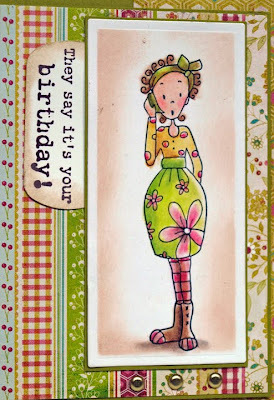 And don't forget to join us in the Hanna Stamps Forum on Tuesday Septe 8th at 9 p.m. est for our monthly release party! I'm so excited to bring our very first Challenge to you. 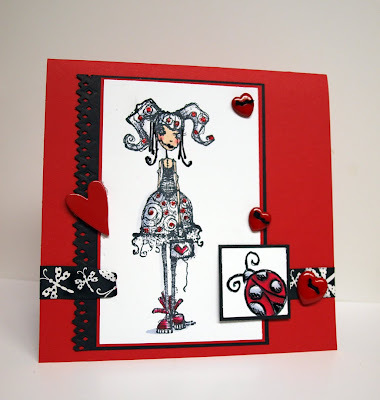 This month our Sponsor is Stamping Bella~! 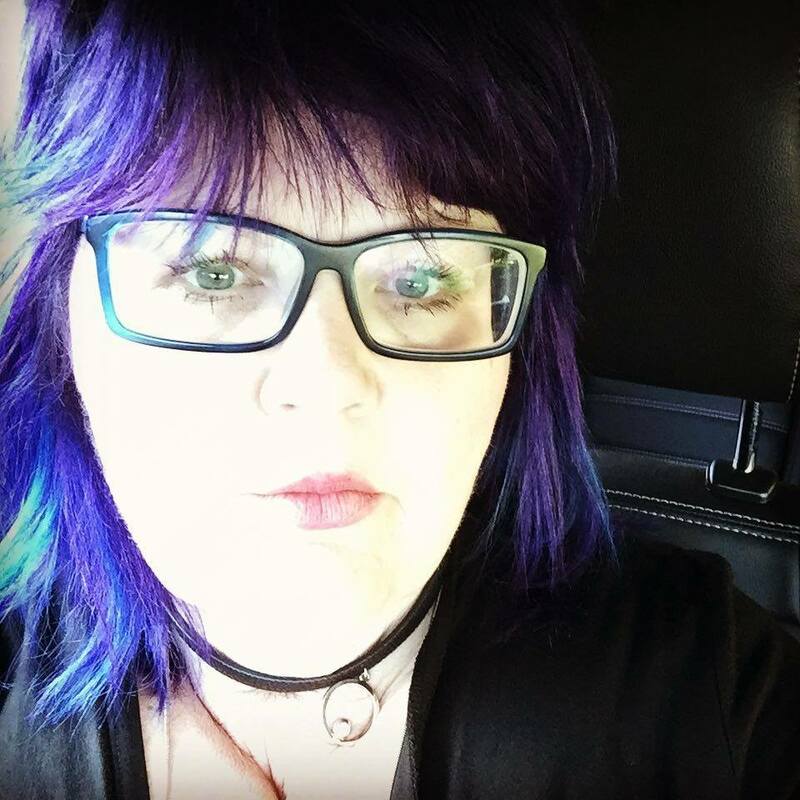 Emily has generously offered a $25.00 gift certificate for the winner, randomly selected from the peeps who play along and post their challenge on the C4C Blog via Mr. Linky! Thanks so much Em, for your kindess! 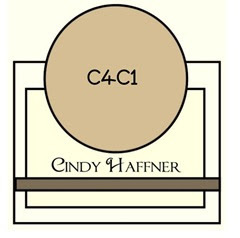 Cindy Haffner is our Hostess for September! This week, she brings you a fabby sketch challenge. I LOVE this sketch!! The sentiment is included with this fun image, which is way coolio in my books!! 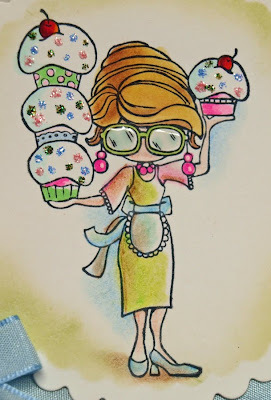 I coloured the image with Prismacolor Pencils, and used some pink, blue and green stickles to add sparklies on the cupcakes! I sponged around the main image with a light medium green pigment ink. A little Diamond Glaze on the Glasses give them...well it gives them a glassy look! lol! Punches are from EK Success and Martha Steward.......The Ribbon is Blue Satin and gee, wish I could remember where I purchased it. 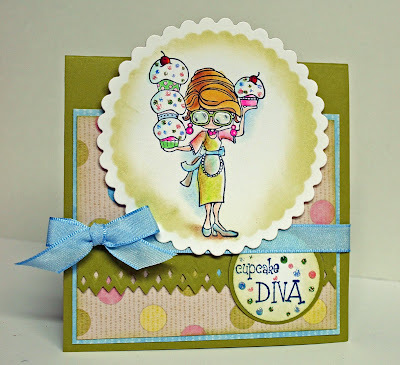 I sure hope that you will play along and visit the blog to see the AMAZING cards from the DT! I darned near died when I went in to upload my card! 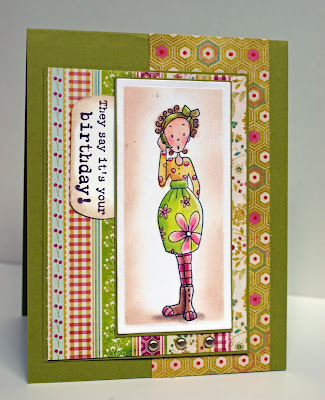 Hanna Stamps September Release Sneaks! 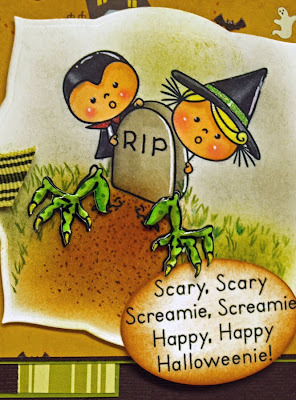 We have some fun fun images for you this month over at Hanna Stamps! Here's a sneak peek of Kristi's latest Riley/Sophie combination! 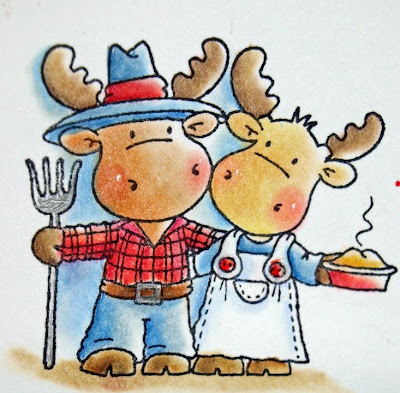 Farmer Riley and his Wife! This image kind of reminds me of the American Gothic Painting, but these farmers don't look quite so somber! I am loving playing with my Prism Pencils. I really love the soft look that you can achieve with Prisms and Gamsol! The Designer Paper is from Basic Grey June Bug Collection. The Prism Equivalent to the Red Cardstock is Classic Red R095-E. Punches are from EK Success and Martha Stewart! Check my sidebar to visit the DT blogs to see what they have in store for you this month! We are postponing the release Party until Tuesday September 8th at 9 p.m. est........and if you trot down two posts, you can read how you can win some loot at the Partay!!!! Also, we will be having a Blog Hop on Sunday with another great opportunity to win some sweet blog candy!!!! Looking forward to bringing you more peeks this week!!! I have to tell you that I've been bubbling with excitement over a few secrets that I will spill over the next couple of months..............finally I can let a little pressure off the cooker today to reveal something that's been in the works for awhile!!!!! My Good Stamping Friends Frances and Cindy and I chat quite often on Messenger and thought it would be super cool to start a challenge blog! 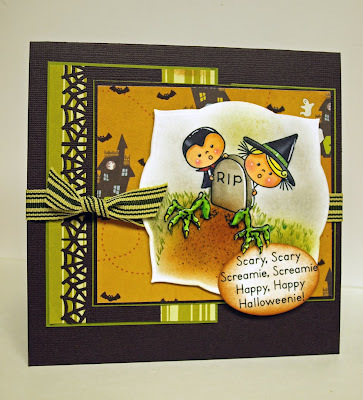 We have teamed up with a group of Super Talented Stampers to bring you Crazy4Challenges!!! Each Saturday, we will bring you a challenge. Our Amazing DT will share their interpretation of the challenge for you to see. We are stoked to have the support of some amazing Stamp Companies and will have sponsors and a monthly prize challenge!!!! I hope that you will come and check us out!!! Take a look at the Talent we have on this Design Team..... I am so excited to be part of this Fabby group! And now for a little card!!! I coloured this Bellarific Image at the Prism class that I took with Paula, as mentioned in my earlier post this week. Paula has such a way with colouring and with choosing such beautiful colour combinations! I swear when I'm on my own, my images don't look quite so good, but they're coming along nicely ! 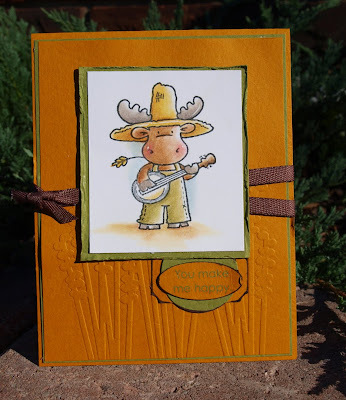 I really just wanted to showcase the image in this case, so I chose to just use plain cardstock, with a tiny section of cuttlebugging...........hehe.........is that a true adverb? just for some texture. Colours are Baja Breeze and So Saffron. Ribbon from SU and Buttons from Foofala!!!!! 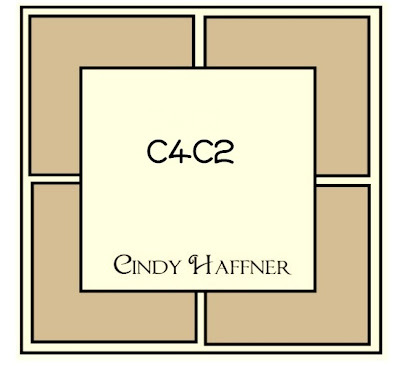 Hope you'll join us On C4C on Saturday September first for our Launch!!! !